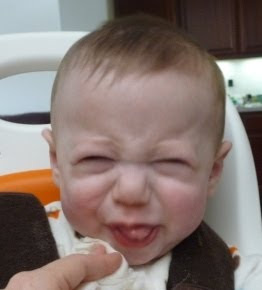 The following picture is what Max looks like when he is ENJOYING a meal of “solids”…..
And THIS priceless picture, is what happens the other 9 out of 10 times we try to feed him…. Our mighty Max is simply not a fan of eating pureed mush on a spoon. It could be pears, it could be carrots. It could be oatmeal, it could be apples. It could be mixed together, or plain, cold or warm, before a bottle or after, in the morning or in the afternoon. Before a nap or after a nap. We’ve tried removing all the distractions. Tried feeding him in my lap. Tried letting him hold the spoon, or another spoon. He could care less. On a VERY good day, he will eat 1/2 of a small jar of food mixed with 1 tbsp of oatmeal or rice cereal. If I sing. And do a little dance. But most days, he just takes a few bites and then shuts his mouth or starts to cry. 1. He won’t let himself starve to death. 2. He should be working up to eating 2-3 meals of solids each day. A “serving size” is the size of his fist. 3. 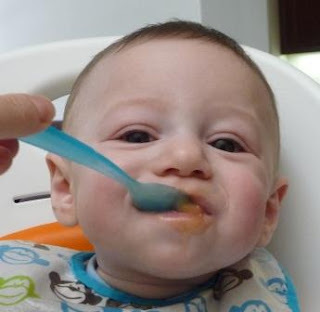 Formula is still the main source of nutrition for the first year. 5. VERY ACTIVE BABIES (ummmm…..Max) OFTEN GET FRUSTRATED BY HAVING SOMEONE FEED THEM, AND WANT TO FEED THEMSELVES. TRY GIVING THEM SMALL PIECES OF VERY MUSHY FOOD THAT THEY CAN FEED THEMSELVES. Ok……like WHAT????? I am terrified of putting a small semi-solid piece of ANYTHING in this child’s mouth! And remember….he is 7 1/2 months old, and has NO TEETH!